At P&H we have invested in the future of manufacturing. With our state of the art equipment and abilities, we can take your product from raw material to painted weldments or anywhere in between. Give us a try on your next project and see what we can do for you. The 4000 watt laser gives us great flexability up to 3/4 of an inch in hot rolled material. We can also cut aluminium and stainless steel quickly and with great accuracies. With the working range of 162" x 83" and the lift master loading system we have the ability to nest different size sheets to maximize output. The hem saw allows us to bundle cut material up to a 15" square. The head articulates to 45 degress for miter cuts. The control allows the operator to program numerous parts from one setup. This machine gives us even greater flexibility in the burning area. 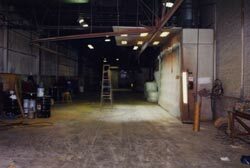 We have a burning area of 10' x 30' and can go up to 1 1/2" thick. With 2 400 amp heads we have the newest technology in the plasma area. The burn quality is unmatched by the older technology. We have a 3/8" mechanical shear with a 10' bed as well as a 3/4" shear with a 10' bed. For rectangular cuts we can serve your needs with great ease. 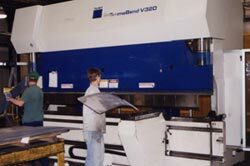 The newest brake press we have is a Trumpf v320. This 357 ton machine has a bending length of 161 " and is one of the fastest press available today. It is complete with a 6 axis back gage which allows for sercure bumping for acurate bending. We also have other press ranging from a 60 Ton Sturdy Bender to a 900 Ton Cincinnati. This list also includes a 300 ton manuel Vrson Press and a 300 Ton Pacific Hydrolic Press. In our press area we also have punch press ranging from 60 ton to a 1000 ton Steelweld straight side. Our Okuma mc60 VAe vertical machining center has a 20" x 60" machining area. 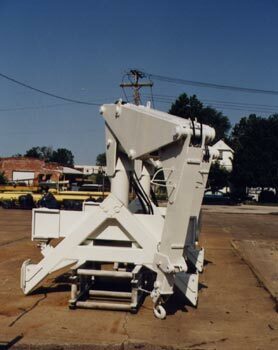 This machine is outfitted with 2 Kurt double clamp vices for increased production. 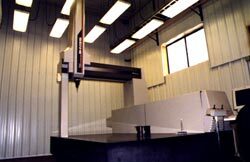 The machine also has through the tool coolent to allow the use of the newest carbide tooling. For smaller jobs we have a Mazak AJV-25/405 Vertical machining center. This machine has an 8" rotary indexing table that can be used. We have an Okuma Cadet Model L1420 Lathe outfitted with the osp 7000 control. With a 4" pass through throat this machine can turn some pretty good size parts. Complete with tail stock this machine has turned a 10" diameter with 40" between centers. For the smaller jobs again we have a Mazak slant turn Model 20 Atc. This machine has available live tooling and a bar feeder. Our 647 Panel master is used for those jobs that have holes to punch as well as profile needs. This 40 ton punching machine has a 300 amp plasma head with it. The 48" x 82" working allows smaller size sheet to be processed quickly. We have a wide range of drills from 3 radial arm drills to a Natco 36 Spindle Drill. We also have various vertical and horizontal mills. We have a 48" mattison surface grinder for the surface critical jobs. We have numerous Mig wire welders. We have both 300 Amp and 600 amp welders avalible to us. 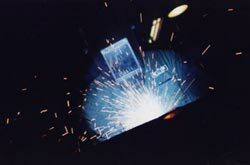 We have the ability to do arc welding as well as hand plasma work. To enhance our capabilities, we have positioners that rotate the weld fixture to allow easier access to the welding area. We have a full assembly department that does the finish work on all P&H products.This department has a Wheelabrator with an 8' table to allow us to shot blast the material before painting. We also have a Pangborn shotblaster with dual 5' talbes. We have a steam cleaner to remove grease and dirt before the painting process. We have one prime booth along with two paint booths. Last, but not least, we have a Dip tank with a motorized track. This piece of measuring equipment is an articulated measuring machine with a 10' capacity. It is presently set up as a stationary piece of equipment but can be mounted on a cart and moved to the floor. The Mitutoyo DCC has a measuring area of 52" x 60"x 40". It comes with a Renishaw PH 10 M touch probe. The cermanic componets allow this machine to measure more accurately than similar machine with steel componets.